We've all had that experience where a book that you've been reading for several days is infecting your brain and mood and you just want a fun, tangible way to connect with it; so what better way to do that then with drink pairings? As the brightness of summer fades into the fresh, golden afternoons of autumn, we're re-stocking our home bars with flavors more complimentary for the season. Fall libations for me mean more complex, seasonal flavors, and drinks that pair well with autumnal meals. I don't like overly sweet drinks, and I admit whiskey is hands down my favorite base to build a drink around for this time of year. With that in mind, we made absolutely sure these pairings were not only easy to execute, but also felt genuinely true to the books. So whether you're throwing a bookish Halloween soiree or just want something to warm you up on a chilly night as you curl up with a great fall read, we've got you covered. This book calls for a sophisticated sipper that reeks of autumn. The main characters are all too cool for school, generally elegant, and a little mysterious. This drink evokes all those things and tastes exactly like fall in your mouth. Plus, poured into a martini glass, it looks especially chic. Combine rye, Fernet, simple syrup, and bitters in a cocktail shaker and fill with ice. Shake until cold and strain into chilled glass. Squeeze a piece of orange peel over the drink and use as garnish. "Four Alexander cocktails, please" says Anthony to the bartender, before drinking them all in quick succession. This is definitely an oldie, but it stands up well, and since it's directly mentioned in the text, we figured it deserved a place on this list. You're obviously going to want something that looks elegant and a little magical for this one; something that wouldn't be out of place at Le Cirque des Rêves. Glassware and dry ice will be key for the full effect, but we chose a drink that reminded us of a grown up version of caramel apples at the circus. This one is a little sweet, a little fizzy, but has a sterner backbone thanks to the whiskey. With the apple and ginger flavors, it just hits all the right notes for fall. In a 12-16 ounce tumbler or high ball glass, combine the hard cider and whiskey. Fill the glass with crushed ice. Fill with ginger ale. *If you use dry ice, please don't consume the drink until it is fully melted! Keeping it classic for this classic short story with a highly appropriate pumpkin twist. Of course, in the story the Headless Horseman famously chucks his head at Ichabod, and the next morning only hoof prints and a smashed pumpkin remain. If you like old fashioned's, you'll love this autumnal take on it! 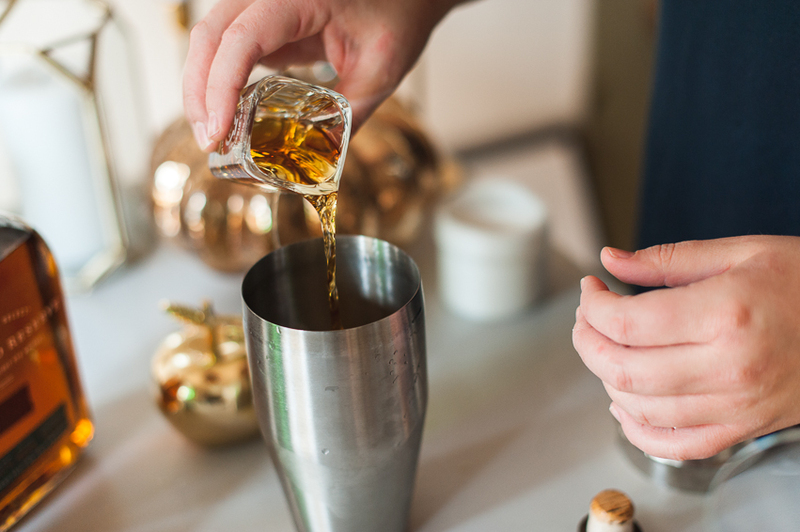 Combine pumpkin purée, bourbon, syrup, Grand Marnier and bitters in a cocktail shaker filled with ice. Shake well and strain into a chilled old fashioned glass filled with ice. Garnish with an orange twist. A hot toddy seemed like the perfect warm, cozy drink for this cozy mystery. The old world charm of this drink fits the ethos of the novel perfectly, and is the best mug of deliciousness to sip while you get lost in the drama going on inside the train stuck in the snow. Put bourbon, honey, and lemon juice in a 6-ounce mug. Top off with hot water and stir until honey is dissolved. *links are affiliate and don't cost you a dime! Thanks so much for your support! 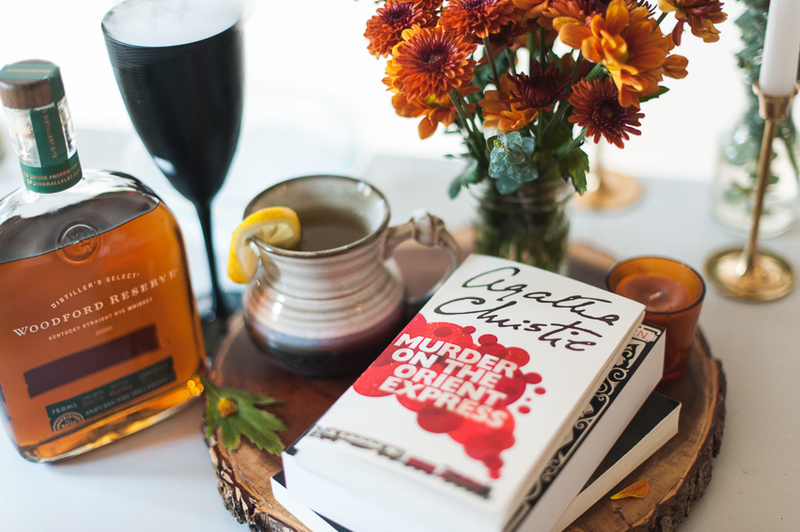 Do you have any suggestions of book + drink pairings? Or a favorite drink for this time of year? We've all had that experience where a book that you've been reading for several days is infecting your brain and mood and you just want a fun, tangible way to connect with it; so what better way to do that then with drink pairings? We've talked about pairing wine before, but if cocktails are more your style, we've got you covered. I don't have a lot of tolerance for drinks that are anything less than perfectly refreshing when it's hot out; preferably with anything berry, citrusy, herby, or sparkling. That ice cold, fresh, bubbly taste is usually my jam in the warmer months, and these drinks all hit those notes. Whether you want a cocktail for a book club, or just something festive to sip while you grill, read or eat dinner outside, this list is bound to have something appealing. Whatever your reason (although who even needs a reason??? ), these are fully tested, and we made absolutely sure they were not only easy to execute, but also felt genuinely true to the books. Also, none of these were pulled haphazardly off Pinterest or include obscure ingredients that cost $20 for one tiny bottle; these are all simple, quick, delicious, and perfectly paired. Fitzgerald's personal drink of choice was a gin rickey and is one of the few drinks specifically mentioned (aside from the endless champagne) in the novel, so we decided to run with it! Obviously alcohol is nearly ever-present in this novel, and often serves to progress the plot and characters in interesting ways, so it feels quite fitting to sip on this while reading. It's also just straight up refreshing and lovely on a summer evening, so there's that too! Squeeze the lime juice into a Collins glass full of ice. Add the gin, the lime half, and top with club soda. Okay, really, what else could we go with here other than rum?? I mean really. Treasure Island is a rum-fueled adventure with pirates headed to a tropical island on a quest for buried treasure; it's the original version of the trope. It's an uncomplicated story that deserves an uncomplicated, tropical, rum-laced beverage. This novel, set in rural Salinas, CA is rife with farms and fresh produce, which are central to the characters and plot. To capture that old-timey rural farm effect, we chose to spike some fresh blueberry-mint lemonade with a bit of vodka. This was especially wonderful as my mint plant is exploding right now, and what better way to use it? Place mint leaves, sugar and blueberries in a cocktail shaker. Muddle mixture with the end of a wooden spoon until blueberries are broken. Add vodka and ice; shake vigorously for 30 seconds. Divide mixture among two glasses. Top with each with lemonade; stir. Does this one even need an explanation???? Guys. Goblets. Filled with Rosé (preferably not laced with Iocane). Because it's summer! Cheers! Which one would you like to mix up for yourself? And what are your favorite summer drinks? We'd love to hear!